I made the rounds in Quinlan yesterday, shopping and passing out fliers for my Open House next Saturday. While on the strip, I was able to shop a couple stores that I had never been in. And what a treat! 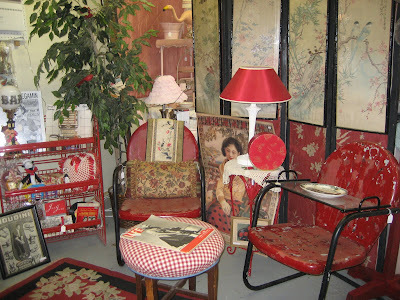 These first pictures are of a shop called Chic & Tiques. Cute name! 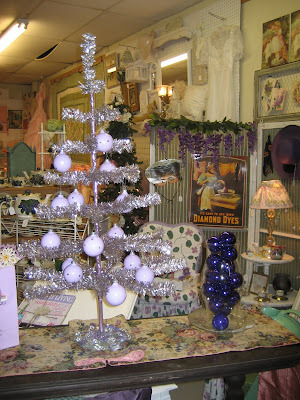 It is located at 110 W. Main St. Tonya runs this place and what a sweetheart! She didn't mind at all that I kept tearing up her displays to buy some base pieces. 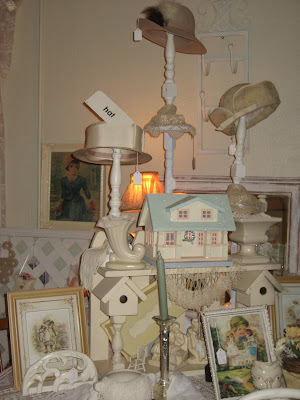 Tonya has lots of cute little vignettes. And great stuff! 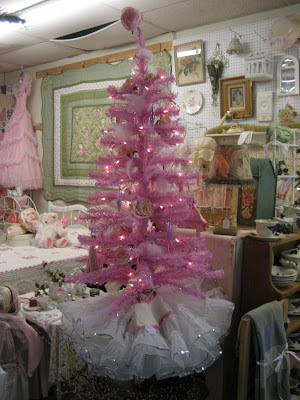 Next, meet Terry at Pink Flamingo Resale Shop. 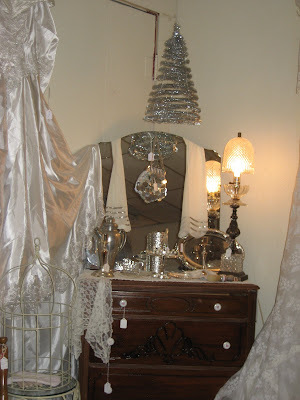 She is located at 112 W. Main St.
Terry also has lots of wonderful vignettes. Fun merchandise. New and old. She has color focused areas. Look at that pink prom dress. Ruffles everywhere! I love these reds. Terry has a gift for placement. And she has great stuff! Oops! I took this picture after I removed my purchases from the top of the chest of drawers. It might have been nice if I'd shared, huh? Oops! 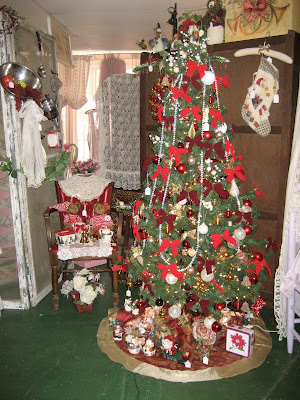 Now, the following pictures each have a colored Christmas Tree. And y'all. This isn't even all of them. 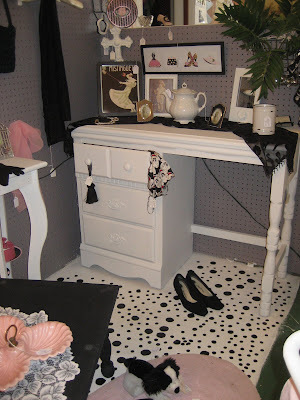 I just couldn't stay there all day taking pictures! Enjoy. 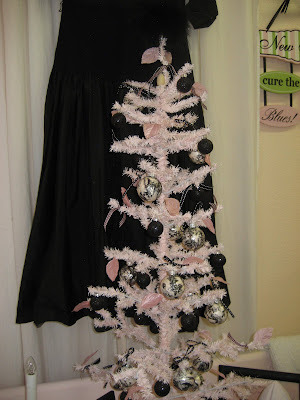 Love the tutu tree skirt! 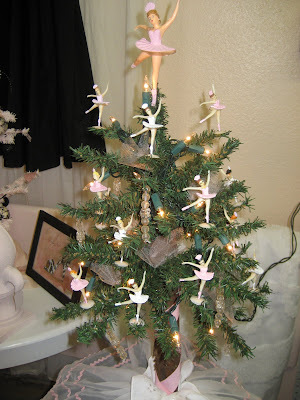 Check out the ballerina tree. How sweet is this? This area with purple was very pleasing to my eye. And I don't use purple anywhere in my home or store. Maybe being different is what appealed to me. While, I was running around Quinlan, Kathie was at Primitiques tearing it up. 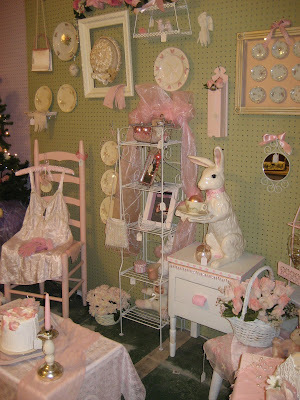 By the time LucyJane and I joined her, she had demolished almost every existing vignette. Seven hours later, we were next door at Jumpin' Jack's Country Kitchen eating chili and trying to catch our breath. Whew! For you local folks, we are excited about you coming out and seeing our new stuff and what we've done with it. 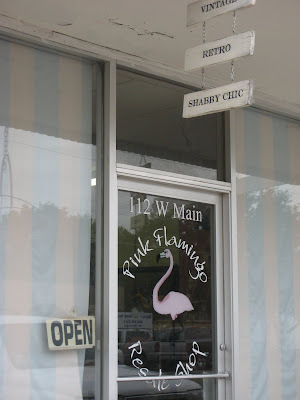 When you come to Primitiques, you should swing by Chic & Tiques and the Pink Flamingo, too. They are about 15 minutes away. Just a hop and a skip! 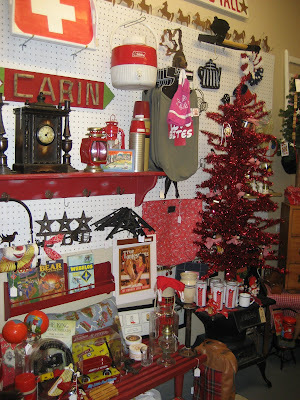 Tomorrow, I will feature another shop in Quinlan. And be sure to come back Tuesday. 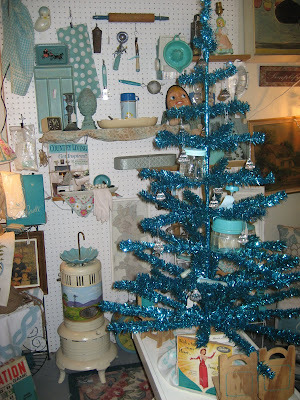 I'll give you a sneak peak of Primitiques in Holiday mode. You know I couldn't stand to not share something from Primitiques! Have any idea what this is on the tree? Trees of every colors. As you say, "How cool is that?" 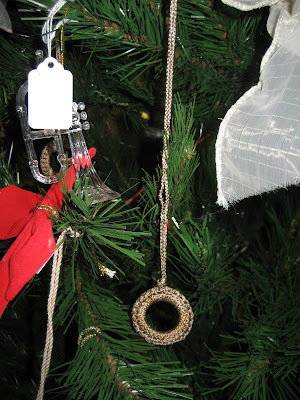 To answer you question, I think it was a picture holder ring. It was attached to the back of a picture for hanging on the wall. Did I win? 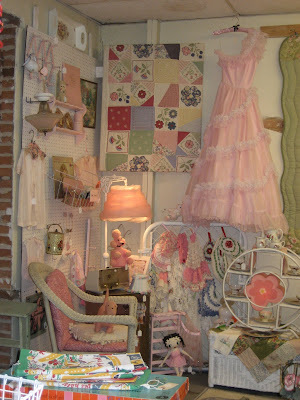 Lot of cute things.